Oops..I added these to the wrong article! 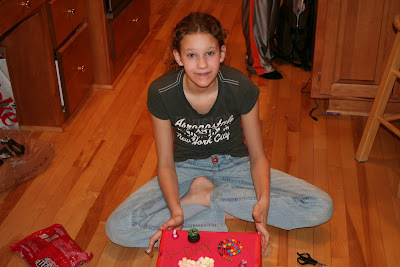 Well, here's Katie, helping Timmy make his Valentine Box. 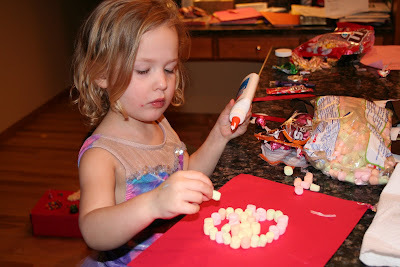 Here's Lily making a mess while I did the hard part of her Valentines...she had to have something like 45 valentines because she's in so many groups that were exchanging them. 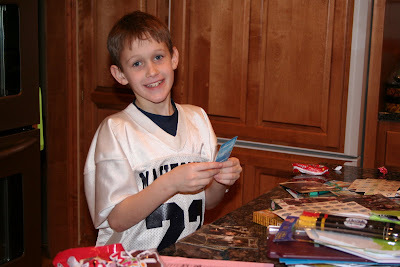 And here is Timmy putting his Valentines together. We had fun. If Andrew and Zach are giving any valentines this year, they aren't telling us about it!!! "Lily, wasn't it wonderful how the oranges tasted with the sugar? Grandma used to do them that way..."
Lily: "Yeah yeah yeah, Mom" (she's picked up her expressions from her siblings.) "Well you should see how great it tastes on your skin! Try it, Mom! It's much better that way."